For peace of mind, and to help ensure that nothing spoils your enjoyment of travelling with your caravan, here are a few suggestions of things to do, or to consider. 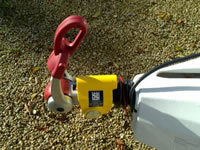 To protect yourself and anyone who uses the caravan these safety alarms are invaluable. LPG and coal (used in BBQs) are very dangerous fuels and caravans are quite flammable. Don’t save money, this is one area that you should always cover, nothing’s more important than your safety. Whenever you travel a good medical kit is a good idea, whilst we hope you don’t have to use it you shouldn’t omit it. The contents of the kit should be tailored to your specific needs, a reasonable example of a medical kit for everyone could include; plasters, bandages, spray-on rubber bandages, light painkillers such as paracetamol, ibruprofen and aspirin, antihistamines for rashes and allergic reactions, TCP or similar disinfectant, anti-bacterial wipes/gel and any useful contact details or medical conditions on a bit of paper. You should never give medicine, plasters, bandages etc to anyone who you do not know the full medical history of. The medical kit should be for you and your family only. Remember to keep it high, out of children’s reach and ideally use an airtight container. If you have an allergy or severe medical condition then a medical alert bracelet is a wise investment. Let’s hope you never have to use it! The fire blanket is a very effective way of stopping or slowing a pan fire in the kitchen and can save lives if used properly, do not use water on a pan fire. A fire extinguisher can be used to stop small fires, but the lightweight versions fitted in caravans are really designed to help you pave a wave through the fire to the exit, so you can get everyone out safely. Don’t try to tackle a blaze with these lighweight extinguishers as they’ll not designed for it and only last a few seconds. One of the simplest and simple deterrents available. A hitchlock surrounds the hitch apparatus and prevents anyone from hitching the caravan to a towcar whilst it’s in place. These usually only take a few seconds to fit and are very handy when taking short breaks on your journey. Available in many different varieties, the range from very simple wheel clamps to highly sophisticated locks that take time to attach. 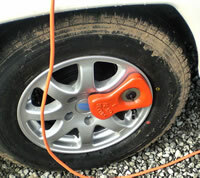 It’s always worth your while to attach a wheel clamp if your caravan is going to be stationary for any amount of time. Alarms are a very effective deterrent to theft if your caravan in kept in a populated place. Tracking devices are designed to help you find your caravan if it’s been stolen and are carefully hidden in the caravan to try and hide the device from the thieves. Many insurers require these devices to be fitted on most caravans and almost all insurers will offer some discount on the premiums for fitting them, so they can save you money in the long-run.